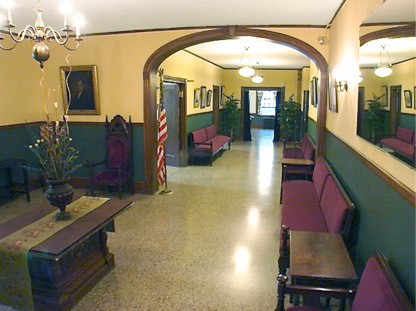 The Front Hall is the main entrance to the building, and is suitable for receptions, ticket-taking, cocktail receptions and refreshments. 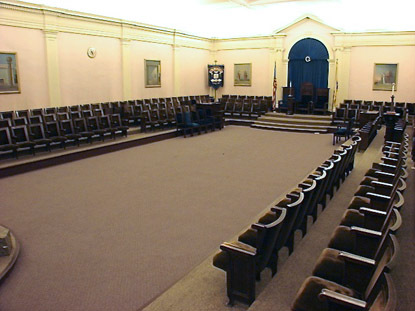 The Hall is furnished with long benches seating about 20 people. At one end of the Front Hall is the main stairway leading to the second floor Dining Hall. 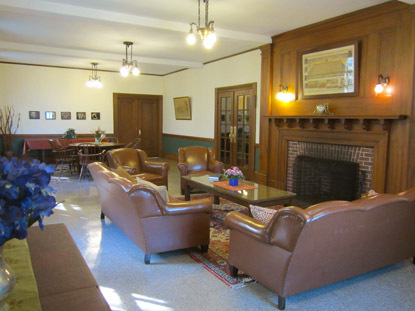 The Parlor is suitable for receptions and discussions up to about 25 people, and breakout meetings. Half of the room is furnished as a conversation pit with sofas and chairs to seat about 10 people in an intimate setting, and additional chairs can be moved into the room. 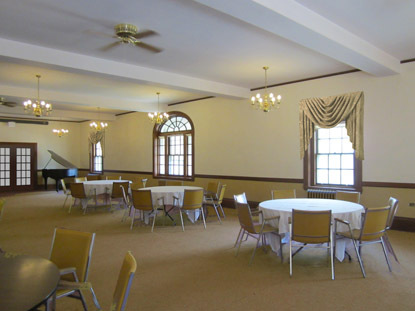 The Function Hall on the second floor is suitable for large banquets, piano recitals, workshops, parties and other events. Seating for 150 is available using rectangular and round dining tables. Use of the Steinway “parlor grand” piano may also be arranged with prior approval. 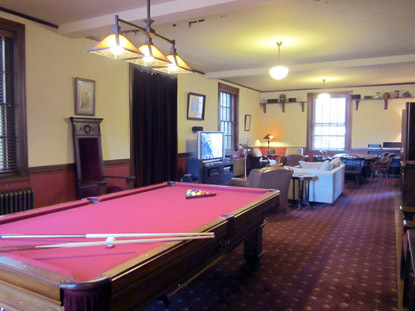 The Club Room includes comfortable lounge seating, a large-screen television basic cable, an excellent audio system, a pool table and a poker table. There is a small refrigerator available in the adjoining ladies lounge. 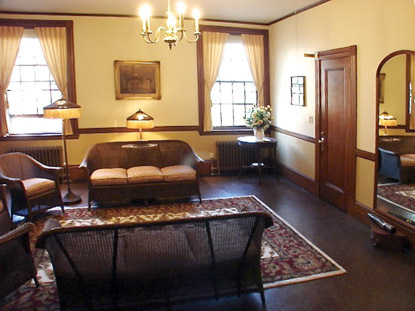 The Ladies’ Lounge serves as a foyer for the ladies’ rest room, and includes antique wicker furniture and lamps. It is suitable for use as a dressing room, child care or breakout meetings. The Kitchen is adjacent to the second floor Function Room, fitted with commercial equipment, and suitable for full or partial meal preparation or staging. The front main steps into the building are frequently decorated with flowers, balloons and signage for events. The parking area behind the building, if not used for parking, is suitable for small outdoor events, such as barbecues and games.